Collectively the 86 players on the Buffalo Bills roster got lumped up by the Denver Broncos tonight. However, the 24-10 score is largely irrelevant to me considering this was just an exhibition game. Terrence McGee had a nice pick to close the first half. The most concerning issue is that the starting offense failed to score a touchdown for the second-straight week in a row. I can’t find the stats to back me up, but I’m fairly certain that is a streak that dates back to 2010. Again, it is just the preseason so it is all meaningless. Still, the fact that the starting offense is so pathetic is somewhat concerning. Ryan Fitzpatrick has looked very much like a seventh-round draft pick in his limited time. Most of that can be attributed to the fact that Demetrius Bell is the worst tackle in football. Even on the plays that he didn’t get run by or pushed into the backfield, Bell was very average. Kraig Urbik still looked bad, particularly on that screen to C.J. Spiller in the first quarter. Chad Rinehart looked good, as did Andy Levitre. Both players will be adequate for the Bills’ needs inside. Unfortunately it appears as if the offensive line, as a whole, will prevent the offense from being successful or even mediocre. Defensively I was impressed with Marcel Dareus. Maybe they should put him at left tackle, it seems like he can do anything else they as of him. The starting defense seems as if they will be a capable bunch but will yield points due to the offense’s lacking (think 2009). In fact, I find little issue with most of the Bills defense through two preseason games. Sure, the second and third teams have a few holes, but that is to be expected. When you get that far down the depth chart you are looking at individual talents instead of group results. That being said, I think there are a few players who may have cemented their spot on the roster. In turn there are a handful who may not make it to the 53-man roster. Aside from Demetrius Bell, Reggie Torbor was the biggest standout for me tonight. He was behind in coverage the entire evening and rarely got to the point of attack in a timely fashion. If Kelvin Sheppard doesn’t get healthy in a hurry I fear that Torbor will end up on the roster. However, if they can find a way to stay strong with their inside linebackers, I would not hesitate to cut Torbor before September 11. As I stated before, Bell was beyond horrendous, he is nothing more than a warm body that stalls drives for this offense. Buddy Nix needs to find a real left tackle and he needs to do it in a hurry. Sadly, there is no better option at this point. I will say that Erik Pears hasn’t been all that bad either. I actually think he may end up being a pretty decent acquisition. Kamar Aiken really impressed me in very limited action. He only had a couple grabs, but I could see him being the 2011 version of Donald Jones. I do hope that Jones has no lingering effects from that terribly dirty hit he took, but the Bills would be better off with a better wide receiver in that spot. Marcus Easley only had two grabs but showed some skill to me, I’m thinking two more strong showings will earn him a spot. 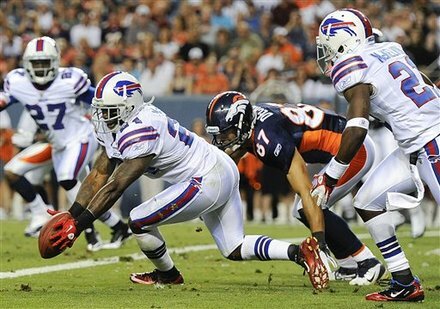 Hell, he may emerge as the #2 man behind Stevie Johnson. Defensively, Lionel Dotson had a strong showing similar to what Kellen Heard did last week in Chicago. Danny Batten needed a good performance and gave it. He was fast and had a nose for the football. A much better player compared to that stick figure from Penn State. Aaron Williams will be a starter for this football team, mark my words. He has talent and I am looking forward to seeing him get into the rotation early this season. Lastly, C.J. Spiller looked like the player who tore up Florida State for four seasons. He was elusive and hit his holes with speed. If it wasn’t for Demetirus Bell being driven seven yards into the backfield, Spiller wouldn’t have had nine yards docked from his totals for the evening. Just another glaring example of how pathetic the offensive line is, and how imperative it is that the issue be fixed immediately.